La Phu village in Hanoi’s outlying district of Hoai Duc is one of the few ancient rural villages that well preserve its communal house and traditional festivals. According to La Phu villagers, La Phu communal house has a large and beautiful courtyard. It has a traditional architectural lay-out with a shrine behind. It is a place of supernatural power with pre-eminent figures. As it was built during the Le Dynasty, the communal house is characterized by the period’s architectural style. Any changes that the villagers have made conform to the original style - from columns to rafters and lacquered boards. There haven’t been any changes in the house’s courtyard. All the original architectural features of the communal house, both outside and inside, are unchanged. In Vietnam’s Red River delta, a communal house is for worshiping a village Tutelary God and holding village events. Nguyen Cong Tam, deputy head of the village festival organizing board, said he was told by the village elders that the communal house is more than 300 years old. “Before the 18th century, it was just a house made of bamboo. Later it was upgraded. The original, small house is used as the forbidden palace. While a bigger building was built in front of the forbidden palace,” said Tam. He said many ancient parallel sentences in praise of the village Tutelary God’s merits are found in the communal house. They are the carvings portraying the daily activities of Vietnamese farmers on columns, beams, spearheads, rafters, and walls that make La Phu communal house a treasury of folk sculpture. Ngo Van Luong, La Phu’s eldest resident, said La Phu communal house is built on a spacious ground in a beautiful location according to feng-shui principles with a pond in front and the main pagoda is behind the communal house. “Our communal house looks like a dragon holding a pearl in his mouth. The so-called pearl in the middle of the pond has been emerging there for hundreds of years. The two wells located at the two ends of the communal house are called dragon-eye wells. La Phu’s communal house stands in front of the main pagoda of the village,” said Luong. The La Phu communal house isn’t surrounded by walls. Its three-door gate is made completely of ironwood. It has a main worshiping hall and a back house. The main worshiping hall has seven compartments and a roof with curved spearheads. The middle of the hall is decorated with two dragons flanking a moon. The La Phu communal house honors the third son of King Hung Due Vuong who gathered and trained soldiers to help his father defeat Chinese invaders. He was subsequently made a top official. His death anniversary is observed with an annual festival. 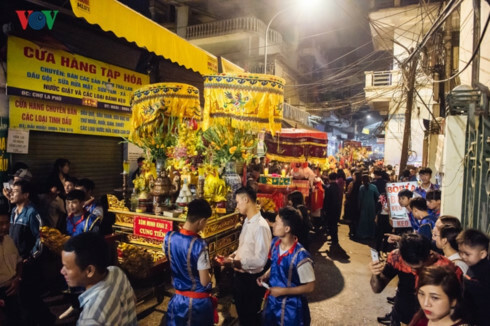 But every five years, the villagers hold grand festival on the seventh day of the first lunar month – the birthday of their Village’s Tutelary God. Villager Nguyen Duy Minh says a palanquin procession is an indispensable part of the grand festival. “A palanquin procession involves three palanquins and a horse. Every hamlet in the village prepares a decorative “gate” and a table of offerings to put at the entrance of the hamlet to welcome the Tutelary God as he passes by. The families living along the road leading to the hamlets prepare offerings of chicken, sticky rice, fruits, and flowers in memory of his great merit for fighting to defend the nation,” said Minh. 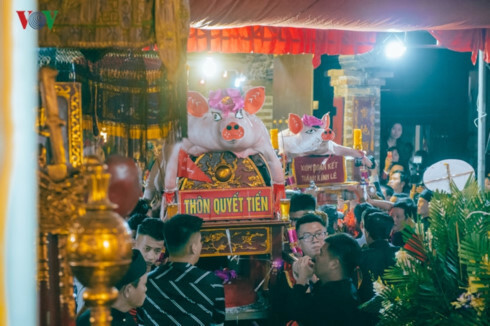 Every year on the 13th day of the first lunar month, a pig procession festival is held in La Phu village, to worship the village’s Genie, General Tam Lang, a talented general and the third son of King Hung Due Vuong, who fought to bring peace to the nation. La Phu village was chosen by general Tam Lang as a troop station. Whenever general Tam Lang set out to fight the enemy, the villagers prepared steamed sticky rice and pork to feed the general and his troops. The general died at midnight on the 13th day of the first lunar month. Ever since, on that day, La Phu villagers organize a pig procession festival to commemorate the death anniversary of general Tam Lang. At the beginning of each year, each hamlet in the village chooses one family to host the pig procession and another family to raise Mr. Pig. The two families should be respectable and have both boys and girls. Their descendants should be successful, and the families should have no family death in the previous year. Ta Tuong Bang’s family of Doan Ket hamlet is selected to be one of the two hosts of the procession. Bang said “It’s a great honor to be selected to host the procession. The slaughtered pig is put into a palanquin and decorated with paper flowers on the head, ears, snout, and tail. The pig’s side fat is used to cover Mr. Pig for decoration together with flowers and reliefs around the palanquin. Every February the selection of pigs begins. The pigs should be well-proportioned, good-looking, weigh 60 to 70kg, and will receive special care with raising costs contributed by the whole village. Pigs are respectfully called "Mr. Pig". If a "Mr. Pig" gets sick, the raiser must bring offerings to the communal house to pray for him to get better soon. At 6 p.m., the pigs and other offerings are paraded around the village to a stirring drum beat. According to the village custom, the hamlets nearest the communal house parade Mr. Pig first. At 9.00 p.m., Mr. Pig is brought into the communal house. At midnight, the elders begin a ritual which will last until 2 a.m. After the ceremony, the pork is divided among the families of the hamlets for good luck. Culture and sports activities are held during the pig procession festival, which lasts 3 days, from the 10th to the 13th of the first lunar month. These activities include folk games, music and dancing, cheo singing, ca tru singing, volleyball, table tennis, and badminton.